This beautiful Norton Shores home is the perfect location for your vacation destination. Large public beach access can be found 1.5 miles to both the north and the south of the house. The massive beech trees that surround the house are part of the private, natural setting for this well-appointed home, making it ideal for a stress-free vacation. The large deck is the perfect spot to sit in a peaceful setting each morning to enjoy your coffee. Once you have experienced Bailey's Beach Retreat your family will want to come back every year! This vacation home is minutes away from all of your favorite "things to do!" Baileys Beach Retreat can comfortably sleep nine guests. The master bedroom has king bed, and the loft bedroom has three twin beds. The bedroom in the basement has a queen bed, and the open sleeping area downstairs contains a twin daybed with twin trundle bed. Throughout the home you can find three TVs, two VCR's, and two DVD players, as well as plenty of games, books, and movies to keep your entertained for your whole vacation. (The internet access can be limited at times due to the location of this home.) The exterior of the home features two decks to grill and relax on. The house is adjacent to a private Elks Park (must be an Elk to enter). 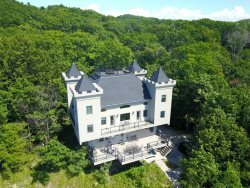 Note from Owner: "On humid summer nights when I was growing up, my mom would pack up our dinner and we’d have a picnic at the Elks Park (which our property abuts) followed by a swim in Lake Michigan to cool off. We always slept better on those nights. I named the house Bailey’s Beach Retreat, because for me, this solitary house in the dunes surrounded by towering beech trees is a special place to enjoy the peace and serenity of nature. We’ve provided lots of games, puzzles, movies and books because for us, the best part of a vacation is laughing and playing with the family, but also having quiet time to read a good book. Our grown-up kids still love Putter’s Creek on the Causeway in North Muskegon for go-carting and miniature golf and of course, Michigan’s Adventure. We never visit Muskegon without going to G & L for a Greek cheddar chili dog special – order it with everything. Try Ryke’s bakery on Terrace St for good old-fashioned baked goods or The Village Bakery in Spring Lake or their other location – The Baker’s Wife – on Washington in Grand Haven for delicious muffins, breads and other treats. Our favorite galleries are the Uptown and C2C in Grand Haven, and Art Cats in Muskegon. Also, don’t miss the Muskegon Farmers Market. They’re open several days a week, but Saturday is best. There’s a baker there who makes a killer cherry strudel and look for the Cheese Lady (who also has a storefront downtown). Of course you’ll also find plenty of fruit and vegetables if you’re into that kind of thing. We treasure every day we’re able to spend at our Michigan home and we hope you will too." Muskegon is located on the shores of Lake Michigan. We are also home to many state parks, including P.J. Hoffmaster State Park, where you can find 10 miles of hiking trails and a beautiful beach. Take a trip to downtown Muskegon where you will find a variety of breweries and restaurants to enjoy. Muskegon is also the home to The Lakes Mall, which is surrounded by shopping, food and fun! Plan on spending a day with your family at Michigan's Adventure for a day of action and excitement. If you desire a day relaxing in the sun, head to the Muskegon River or the White River where River Rat Rentals and Happy Mohawk Canoe will rent tubes and canoes for your family to calmly float down the river. This property is located in the city of Norton Shores. Lake Michigan is just a short walk from the house. A few miles down the road is Lake Harbor Park, featuring trails, dunes, the big lake, and a channel to Mona Lake, a smaller lake that has a beach of its own. For a day of fun, head to Craig's Cruisers for mini golf, go-karts, arcades, and so much more! All of this is waiting for you to enjoy on your vacation to Muskegon! We did all on line. It was a great place for our family to visit and join us for a meal and the grand kids to play and take a nap. We had a wonderful vacation at Bailey's cottage. Any questions that we had were immediately answered by your team members. When we got to the house, the AC was not cooling properly. They immediately had someone come out to fix the problem. This house was very well maintained, very clean, roomy, and comfortable. It was in a peaceful, wooded setting but still very close to the lake and several stores and restaurants. We had more than enough space for our family of 8, especially with the huge basement. We loved everything about it, and we would definitely stay there again. Overall, it was very enjoyable experience. The house was very nice, quite, and peaceful. The only improvement would be better quality towels as the one provided were small and thin. We really enjoyed out stay at Baileys Beach Retreat in Norton Shores. The house was clean and in great condition. It was nice to be in the quiet woods yet close to the things we wanted to do. We spent time in both Grand Haven (15 min to the boardwalk) and Muskegon (20 minutes to the beach, 25 to the theme park) and it was very easy to travel to both. A nice park just a mile down the road to take a walk or short hike in. We absolutely recommend other families or couples to stay here. There is even a fire pit and wood for evening fires if needed. The garage was nice to keep the cars in especially on rainy nights. We were very happy and comfortable with the house we rented and would stay again. Even had my husband wanting to buy a second home in an area like this. Lovely house; spacious and inviting master bedroom. Kids loved the jacuzzi tub; and all of us enjoyed roasting marshmallows in the fire pit and eating watermelon on the back porch. More than enough room for our family of 5. Close to the beach in any direction. Clean and well maintained inside. If you like to run or bike, this is a great place for it. Wide shoulders on the roads, sidewalks in good condition, and drivers that pay attention. Really enjoyed our stay here and would love to go back.